BECKHOFF Automation extends its range of measurement terminals to allow measurement applications with demanding requirements for accuracy and dynamics to be seamlessly integrated into a standard control system. The new EtherCAT terminals from Beckhoff handle measurements for temperature or weighing applications. The 4-channel EL3314-0010 thermocouple input terminal, for example meets all requirements for high-precision temperature measurement while the new EL3356-0010 is an analogue input terminal for direct connection to a resistor bridge or load cell. The EL3314-0010 EtherCAT terminal allows Beckhoff to extend its impressive range of measurement terminals even further by integrating temperature measurement into the standard automation system, eliminating the need for a dedicated and separate measurement system. The analogue input terminal enables direct connection of four thermocouples. 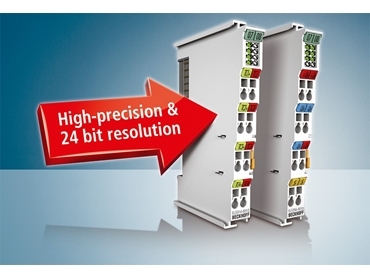 The EtherCAT communication system, in conjunction with high-performance industrial PCs forms the basis for integrating the measuring tasks previously handled by specialised equipment in the standard control platform.